Fresh Premium Quality Garlic Paste Non-diluted, strong flavoured minced garlic. A convenient way of adding ginger to cooking. Does not contain salt or sugar. 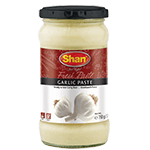 Shan garlic paste has been made using fresh Himalayan garlic. 1 tablespoon amounts to one portion, so a little goes a long way! It has a strong, aroma and a thick, juicy consistency. This pre-prepared garlic paste is a convenient way to add garlic to a dish. Product of Pakistan.